We have a serious "pants on the ground" issue going on over here. 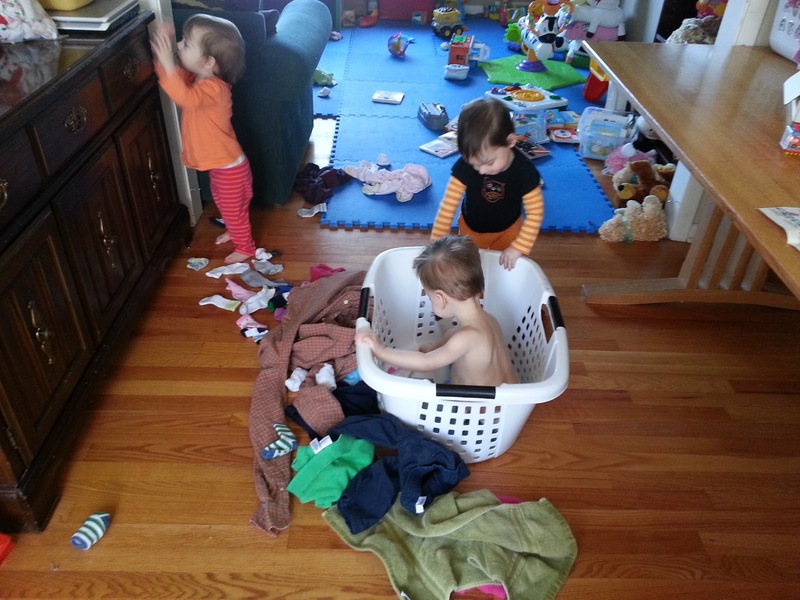 Why is it that my kids love stripping off their pants and diapers to feel the December air flow past their bums?! It's incredibly funny and so irritating at the same time! My Eli, bless his sweet heart, enjoys reaching into his pants and pulling off one of the diaper tabs. 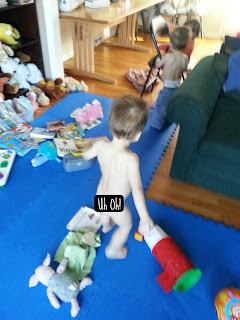 He then runs around the living room with the diaper tab flapping in the breeze. He's been doing this for a few weeks, but we normally just refasten it and send him on his way. Not a huge deal because he normally leaves his pants on. It started like any other day. We got up in the morning, I changed the kids from their PJs into their day clothes, and headed into the kitchen to fix breakfast. That's when I saw the two shirtless wonders whizzing past the gate. That's the first time they've both managed to get their shirts off at the same time, and they were thoroughly enjoying it! So many giggles and laughs, I had to take a picture. I put their shirts back on, but they were quickly removed again after breakfast. Oh well. I turned the heat up a degree. Boys will be boys, right? And then he went back to running on the couch again and then back to the floor while laughing and squealing the entire time. This boy was having the time of his life! He wasn't wasting anytime getting in as much movement as he possibly could until Mommy decided to be a party pooper and force him back into a diaper and pants. I was so thankful and exhausted when morning nap time finally arrived. I felt like all I did was chase naked children and pick up laundry all morning. Of course, then I heard a holler from the bedroom and went up to find Elijah stark naked again and having peed all over this crib. Can you imagine trying to explain these antics in full detail for someone not there to see them? I did show Sean the photos when he got home, but I don't think it made a total impact until Elijah decided to demonstrate his new skill for Daddy after dinner. Only this time he pooped, then took off his diaper, and then started flicking what should have most definitely remained in the diaper around the room. Good heavens! And he isn't the only one stripping (I can't get Ellie to leave her pants at all, and she's been caught diaper-less in her crib a couple of times), but he is certainly the one who feels the most freedom when he comes to embracing his birthday suit. 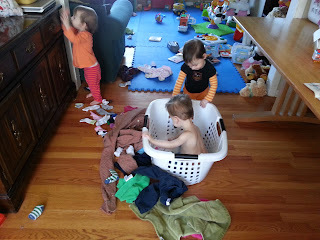 I can't be the only mother whose kids have decided that this is a fun pastime. Do you have any crazy stories like this?? 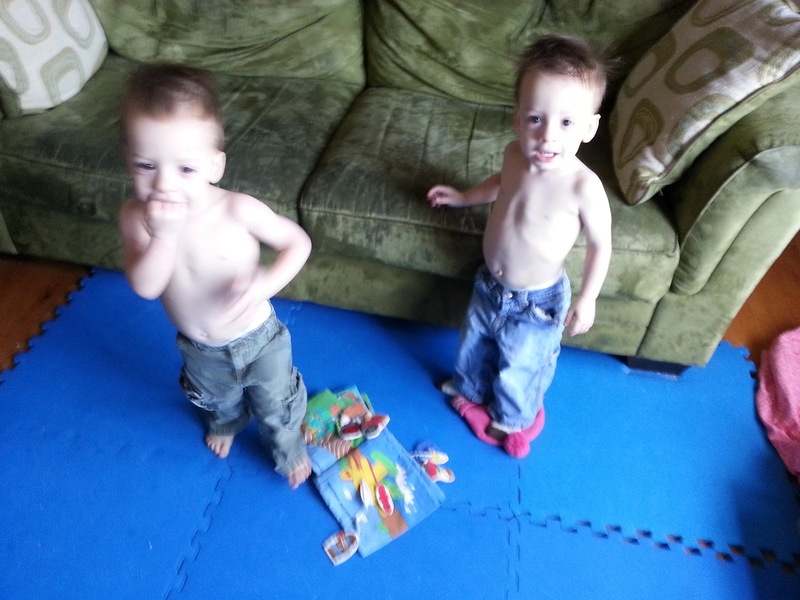 My twins love taking off their pants and diapers. I have to keep them snapped into a onesie or in zippered PJs (with the top safety pinned so they don't unzip it) otherwise they get naked really fast. If they are in their cribs, they like to get naked and "paint". Onesies do make it a little harder to get access, and we've used duct tape around the top of the diaper too. I haven't tried the safety pin thing yet, but I'm sure that's next! Thanks for the idea! Looks like its potty training time! Not sure if this Mama is ready for that yet! Can you imagine potty train four at the same time? I can't...yikes! Haha! We cosleep and one night I went to snuggle with my daughter. I put my arm around her and immediately woke up because I was snuggling a bare bum! I have no idea when she took the diaper off but we managed to avoid pee on the bed. *Usually* a Flip cloth diaper cover over top of a disposable will keep the disposables on her. I bet that was quite the surprise! Lol! I'm glad you caught it before you had to change all of the sheets though! I hadn't thought about using a cloth diaper over the top of the disposable one, but that's a great idea! Thanks for passing it on! They take them off because they can. They are just learning their world and exploring. They will get over it and if you don't make it a shameful thing or a game of wills you all will be happy in the end. They are too young to potty train or to put into fun "big people" pants. Maybe one of those incredibly talented grandmas or aunts back there can make some dolls that are about the same size as the kids and let them learn to dress and undress them that will take some of the energy and redirect it. But in the end they are just learning about their clothes and bodies and they will go on to something else if it doesn't become a battle of wills. Just had a great 3 days with G.Grandma Twilla and hope to come back to Kansas next year. This reminds me of a post I saw on another quad mom's blog that I follow: http://coxquads.blogspot.com/2011/12/double-naked-trouble.html. Good luck keeping your sweeties dressed and diapered! I hadn't heard of the overalls idea! Thanks for sharing that! I read on another quad blog (I believe it was 4tunate), that they had to break out the duck tape. Just add this to another of the 101 uses. I have 4 girls and used to do daycare. 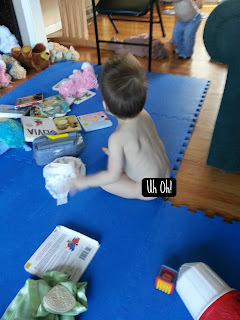 As soon as they started taking their own diapers off it was time to start potty training. I've had great success and no one over the age of 2 in diapers. All we did was when they took their diapers off it was time to sit on the potty. Then put a diaper back on. We didn't do pull-ups either. Those are more expensive and feel like diapers to them anyways. If you wait to potty train it makes it much harder bcuz you have already taught them they should keep their diapers on no matter what. Potty time is always before and after naps, and eating times. They will get the hang of it so quick you won't even realize it. Don't make sitting on the potty a chore. It's something fun (but not too fun to encourage playing) and always praise if they do something. We just do clapping and a big Yeah. Also if you ask them and they say no, they most usually go with in 10 min. They may not have had to go but you reminded them and now they will. Oh goodness...I'm not sure I'm brave enough to start potty training yet. Maybe by summer, I will have worked up enough courage. It sounds like you have definitely perfected the art though! When you were potty training, did you keep a potty stool in the same room they were playing in for quick and easy access? Or did you take each child to the bathroom every time? And wow! Painting the TV with poop...so gross! TV watching would never be the same again! You really should try sticking them on the potty and praising them if they go there, per Mary's advice. Don't be scared. If they catch on you'll be so proud and glad! You're going to have to put in the time investment to potty train sometime anyhow. Jedidiah is already pooping in his little infant potty - at 2 months 11 days! We take him and hold him over it after eating and waking and whenever we have the intuition that he's cueing us to go. Sometimes we miss and he goes in his diaper anyway, but that's probably only 1/4th of the time. :) I'm hoping he'll be diaper-free soon after he can walk. Thanks for stopping by! I'm looking forward to checking out your sites! Oh that is too funny (and cute)!! I kept thinking of that "Pants on the Ground" song when reading your post. Lol!! I am so happy I am not the only one! I have 3 boys 4,10 and 11 and I still long for non naked days! As for my 11 year old it got better not perfect around 7!